We are one-year away from the Solar Eclipse that will be visible across the United States on August 21st, 2017. I was watching the weather this past week to see where the best locations -- the most cloud-free spots-- would be, IF the eclipse had occurred this August. 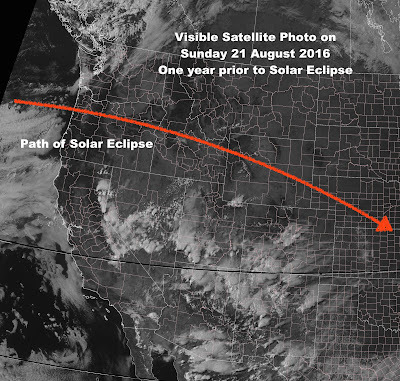 A few days ago, there were clouds in the path over parts of Idaho & Wyoming, most other locations to the east and west (in the western half of the United States) were relatively clear. The day before, some high thin clouds and contrails were present around noontime in western Wyoming. 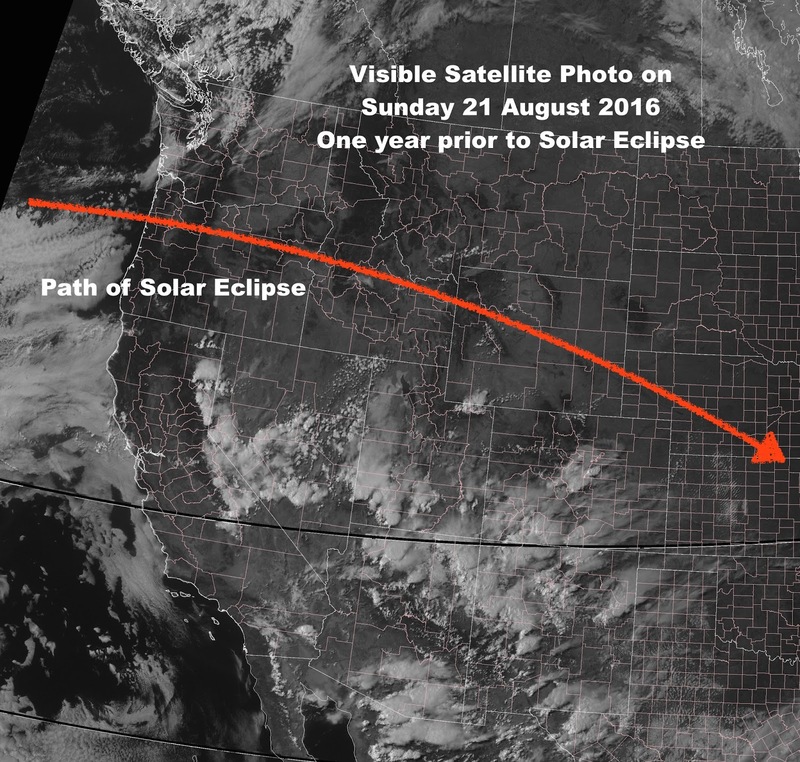 However, on Sunday the 21st of August 2016, skies were generally cloud-free along that entire path of the eclipse, from Oregon to western Nebraska. Although, there was plenty of smoke and haze to be found in parts of Idaho, Wyoming & Oregon from large forest fires that have been on-going this past month. If you zoom-in, you can actually see some of the smoke plumes on the visible satellite photo taken in the afternoon on Sunday, August 21, 2016. For next August, it would be ideal to see a repeat of the sky conditions along the path, but without the fires to dim the show.